We are one of the top-rated companies for manufacturing, supplying, wholesaling and exporting of various kinds of supreme quality Printed Scarves Manufacturers. Our products always are made of most excellent quality material and that is why it is in higher demand in the market. These Printed Scarves which we are providing to our clients are also one of the highly demanded products of our company. Vishal Handicrafts- A unit of Indian Wholesell market,We are the reputed seller of Indian Textile. 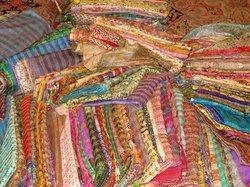 we are provided a hudge range of- Pashmina Shawls , Wool shawls, Silk , kantha Silk, Embroidery Silk. 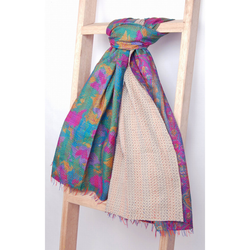 We are offering Ombre Viscose Pashmina Shawls that are adorned with intricate embroideries. These are embroidered with quality threads by skilled artisans and craftsmen, who have years of experience in this domain. Our complete array of shawls is soft and smooth textured and is equally warm. 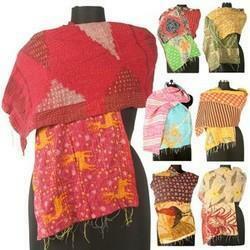 Moreover, A hudge range shawls are available in a wide variety of colors and designs. Handmade Silk Scarves are beautiful reversible printed shawls with intricate hand stitching done all over it. These handcrafted shawls and stoles are made with two vintage sari Cotton fabrics, stitched together with very fine hand stitching done in straight lines all over, creating amazing effects. 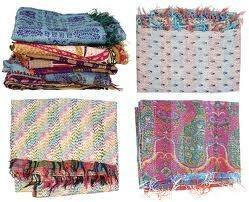 Vishal handicraft provided a Kantha Silk Scrafs quality product. We are the leading supplier and manufacturer of Kantha products. We are the specialist in handmade products. 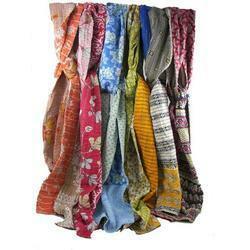 Kantha scarfs is a traditional fashion scarfs. We provided a unique range of vintage textile products in Kantha and home furnishing. Vishal a name of trust by our clients. Because our service and our work is our definition. We make relation with client. We are looking for export inquiries from Japan, Australia etc. 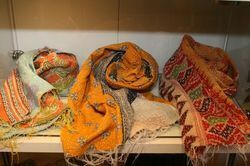 Kantha shawls/ scarves are famous for their unique colours combination and patterns. 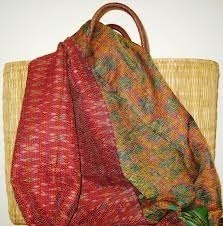 Kantha shawl/scarf are made completely by hand stitch over the handloom silk . the designs and rich texture that are commonly made on the fabric area lively design of flowers ,traditional and geometrical. Vishal Handicrafts- A unit of Indian Wholesale market,We are the reputed seller of Indian Textile. 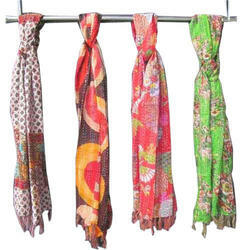 we are provided a hudge range of- Pashmina Shawls , Wool shawls, Silk , kantha Silk, Embroidery Silk.